As your business grows, so does your need for IT support. Whether your company has an existing onsite IT team or not, lengthening your IT response times only slows your company’s production. Outsourcing IT services to leverage your IT staff can be done with flexibility that fits your needs, but is important to choose the right IT support services partner. This guide breaks down the challenges that concern people in management in organizations across the country. If you’re concerned about the state of your IT department, no matter what it might look like, you’re not the only one. Do you find yourself asking these questions when you’re faced with continually slow IT response time? >> What leads to slow IT response times? >> How do you know if your current IT staff is as qualified as you think? >> How can a business leverage their IT staff if there isn’t a staff onsite? >> Why are managed IT services the answer to leveraging your IT needs and eliminating slow response times? You’re not alone. 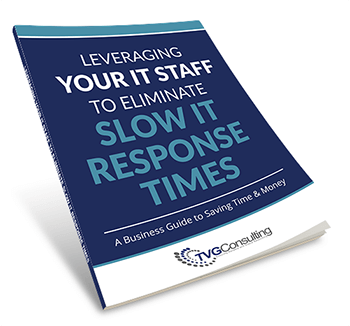 Slow IT response times are an issue for even the most technologically proficient organizations—but they don’t have to be! TVG Consulting can assist you with Managed IT Support Services that will speed up response times and increase productivity, saving your organization time and money.